Manitoba Liquor & Lotteries is proud of the partnerships with all the different Liquor Retailers throughout Manitoba. The term ‘Liquor Retailer’ may refer to any of the following: Liquor Marts, Liquor Mart Express, Liquor Vendor (rural), Beer Vendor, Retail Brewers, Sacramental Wine retailers, Specialty Wine store, and Duty Free stores. 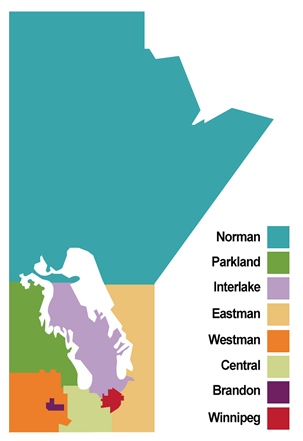 To assist Manitobans in locating their local Liquor Retailers we have grouped the retailers into provincial regions. To begin your search, click on one of the provincial regions on the map or accompanying legend. On the next page, enter your postal code and preferred distance (in kilometers or miles), and click ‘Apply’. The search results will return all the Liquor Retailers in the specified area, grouped by category. Browse through the list page by page to find your favourite location!